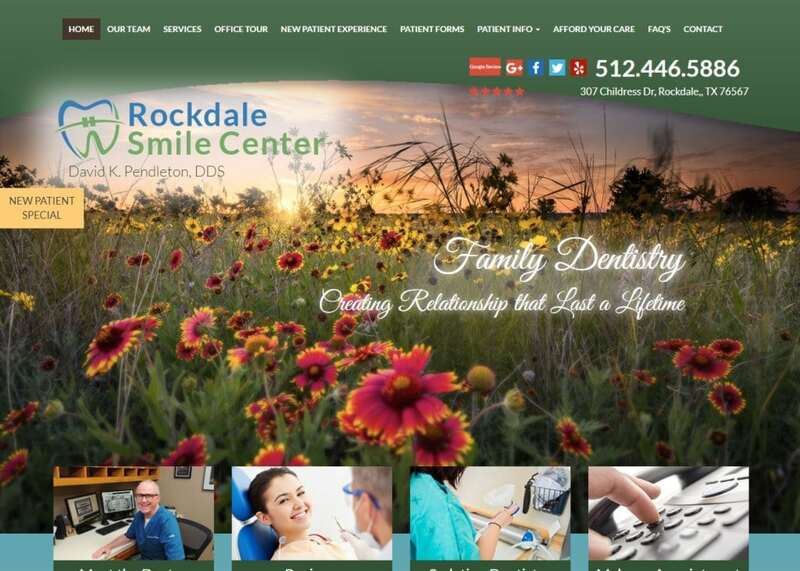 Rockdale Smiles Center understands the importance of establishing a strong patient-doctor relationship. That is reflected in Dr. Pendleton’s moto creating relationships last a lifetime. We made sure to design a layout that would immediately draw first-time visitors in with an easy to navigate and modern website. The website design is simple and modern. The homepage is home to the team’s mission statement, reviews, and services available. Booking an appointment is always available – we added a contact form on the right side of the web page. There are also pictures of the dental office and Dr. Pendleton himself on the front page. Down below, there is a rotating testimony gallery as well as directions to the office. To wrap up the header, we also implemented social media links and contact information. We used a mixture of blue and green when designing the site. Green is primarily used to highlight calls to action while blue serves as a background. When used together, they contrast well together; not too aggressive but not overly soft.When you are marketing for any website, you want to make sure that the colors you provide match the specialty. We never want the color palette to overshadow any of the actual content on the site. The colors we chose to complement the typography and the overall layout of the website. When incorporating multiple elements of design in any website, you want to make sure that everything flows together. We made sure spacing was expertly managed throughout the site by using white space to establish image areas and frame text. Navigation is spacious. No matter which web page you are on, the navigation menu is always available. We used square borders throughout the layout to ensure that everything would be appropriate in proportion. The office tour and the meet the doctors’ tabs on our navigation menu feature live photos from the Rockdale natives. Not only is this a great way to add a personal touch, but it is also another great way to jump-start the patient-doctor relationship. First impressions matter. To help generate more website traffic, we created several links to help market their promotions and offers. There are also testimonials and widgets of their social media located conveniently throughout the website. To top it all off, we integrated an interactive Google Map for easy access and driving directions! The FAQ page located on the navigation menu is a great way to inform and educate patients. The patients are always taken care of with Dr. Pendleton. The patient forms and patient portal are also available on the navigation bar. Under the afford your care tab, new patients can find the details about payment options when it comes to the different services offered. Last but not least, there are promotions offered in-house. We included a widget for easy access. A straight-forward and down to business dental practice with a welcoming air. Efficiency is the primary concern in this site’s design, but not at the cost of a warm and inviting atmosphere. For the right visitors, the ease with which information is obtained and contact information found will make it seem like a more welcoming experience and its one of the things we’re proudest of with this design.